As a photographer, it’s a gift to work with a family who loves photos and puts their trust in you as an artist. That’s exactly how I feel whenever I work with the kind and adorable Exler sisters, Gabby and Adrianna. Just recently, I had the pleasure of capturing Adrianna being proposed to by her beau, Stephen. 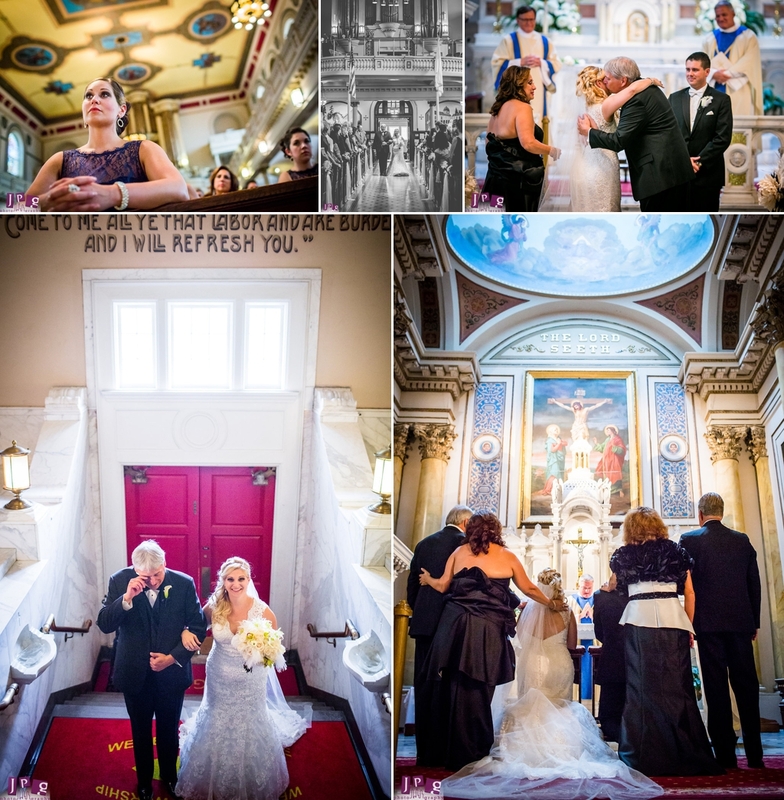 Her milestone comes several months after Gabrielle and her groom Rob said “I do” at their elegant Cescaphe Ballroom Wedding. The day began with the bridal party getting ready at the Old City Society Hill Sheraton. 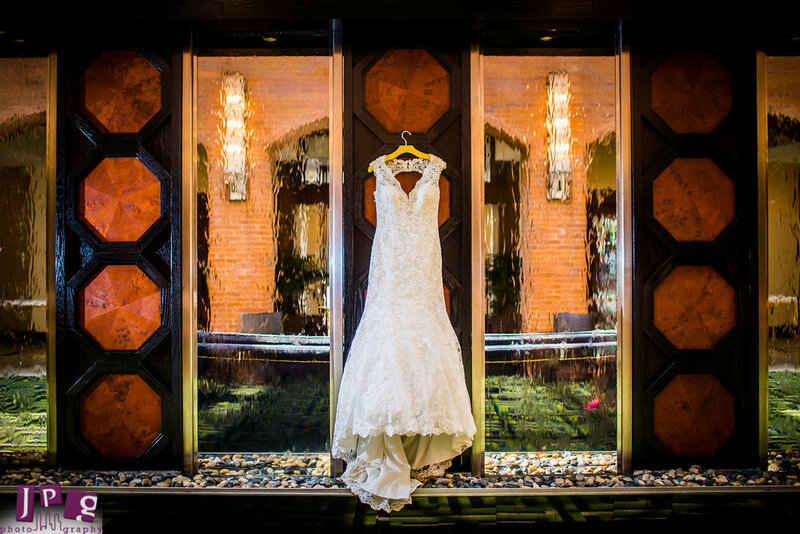 As mentioned before, having a client’s trust is a gift, and I’m so glad Gabrielle put her faith in the team and allowed us to explore, such as getting a gorgeous shot of her dress in between two standing waterfalls in the lobby of the hotel. 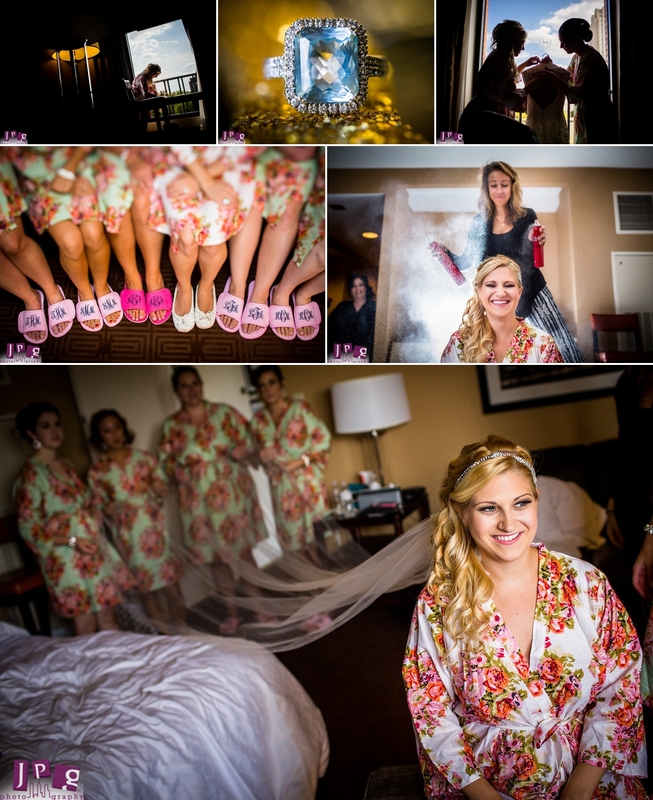 As they were getting ready, Gabby and her bridesmaids wore matching robes and slippers. Their impressive attention to detail made for some fun photos, but soon it was time to move on towards the big walk down the aisle. St. Augustine church in Philadelphia is bright, airy, and colorful, as far as Catholic churches go. I can see how anyone would love to get married here. 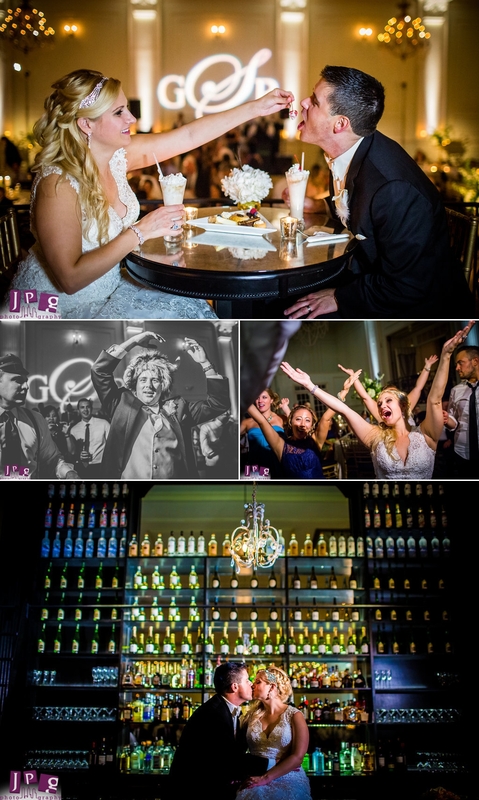 The environment filled every frame, and was rivaled only by the pure emotions of the guests. 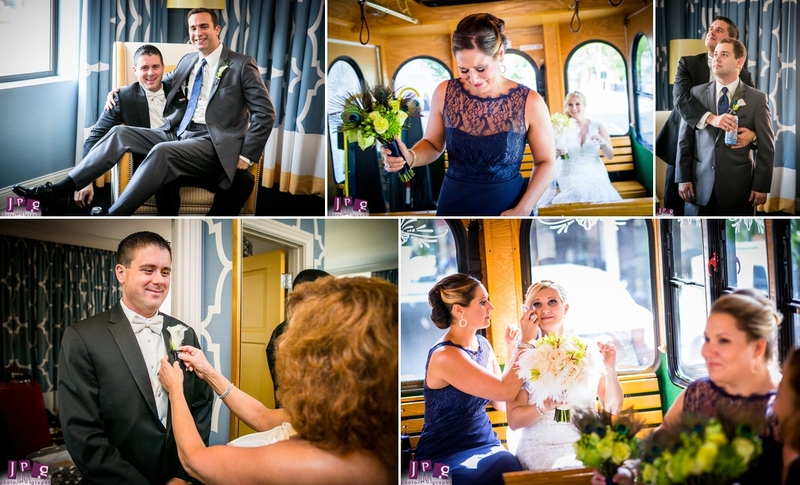 There wasn’t a dry eye to be found as Gabby and Rob exchanged vows. After a lovely portrait session in Headhouse Square near 2nd Street, Gabby and Rob made a dazzling sparkler entrance into their Cescaphe Ballroom reception. And then, I saw something I can honestly say that I have never in 12 years seen before. 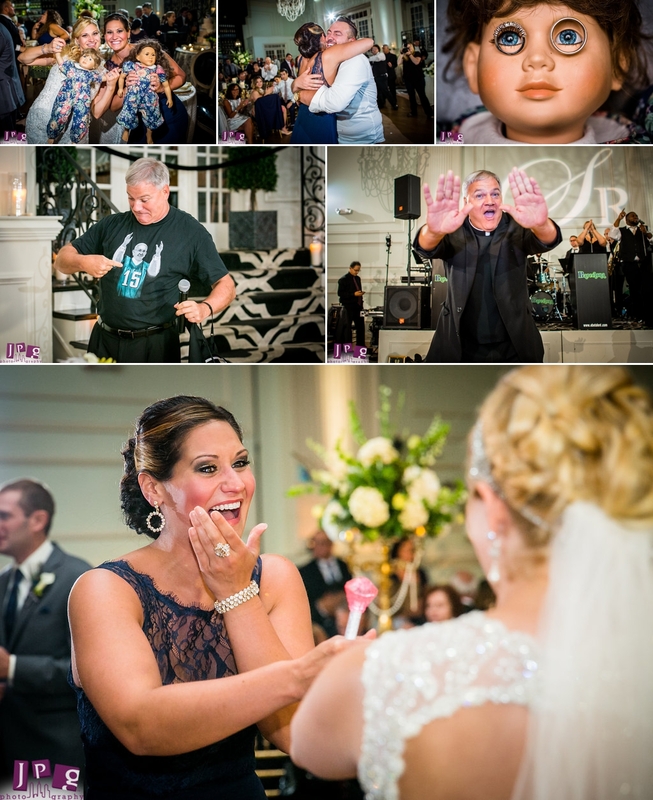 During Adrianna’s Maid of Honor toast, she busted out two identically dressed, life-like dolls from their childhood. They were both adorable, and freaky, something out of Chucky, but also meaningful in a crazy sister, ‘I-can’t-believe-you-remember-this’ sort of way. Too funny! Congratulations, Gabrielle and Rob! Thank you for choosing JPG Photography. We look forward to sharing more moments with you and the family, dolls and all.